May 17, 2006 Woke up this morning about 5am local time. Walked around some with Lucky and Nick. Met Bob walking back towards the van. He said he had gone a couple of miles. We found a little pond. There were animal tracks around it where various things had come to drink from the pond. 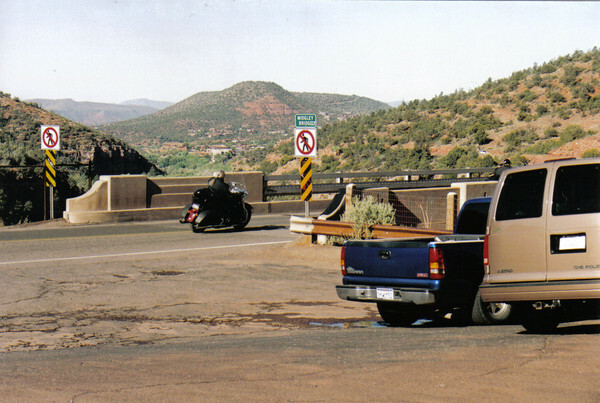 We got back to the van, packed up, and we headed south to Oak Creek Canyon (which is just north of Sedona). We stopped at Midgley Bridgley and took pictures. 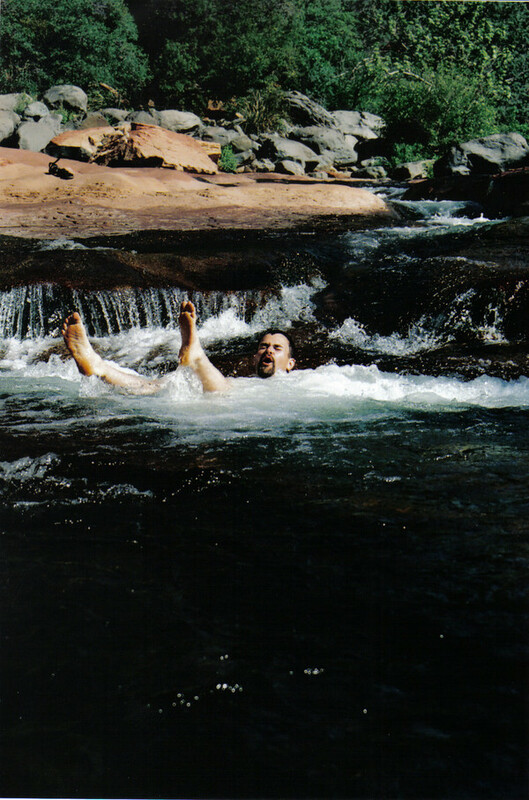 Then we headed back north along the same road and stopped at Slide Rock State Park. We swam in "the slide". Probably spent 1.5 hours or so there. It was cold water. It did get better as you got used to it. From there, we went to Oak Creek Vista, which was an overlook over the entire canyon. There were a lot of Native American vendors. We ate lunch across the street from the Safeway at "Our Daily Bread" deli back in Flagstaff. The owner of the deli recommended the Devil's Bridge trail in Sedona for good hiking) Lucky and Bob were off buying Lucky's hiking boots at that point. Then went back to the Safeway and I picked up some more food items: granola bars (to be split with Nick), apples, bananas.. The checkout lady recommended Havasu Falls as the best place to go in the Grand Canyon. Then we headed north to climb Red Butte. It rained on us a bit as we were driving there. We got up to 8,046 feet as we were passing through the San Francisco mountains just outside of Flagstaff. Climbing the Butte took us about 40 minutes going up, and 26 minutes coming back down. On the way up, Song asked at one point why we had to go so fast. It was 1.5 miles each way. From the bottom, Bob took off. He certainly didn't waste any time. I suspect that he treats Red Butte as a test course for the Canyon. Based on that simple test he can gauge basic abilities. He didn't ever say as much, but that's my guess. On top of Red Butte, they have a fire watch station. "Bruce" the firewatcher was at the top, and we chatted with him for a while. Bruce was a neat guy. He's a painter, and has a gallery in Moab, Utah. He spends a couple of weeks at a time on the top of Red Butte, and said that he was seeing about 1 fire a day, but if it stayed dry for a few more days that he would likely see quite a bit more action. You could see into the Grand Canyon from the top of the Butte, but you couldn't really make out too many of the features. It was still far enough away that Wotan's Throne was the main thing. You could clearly see the North Rim, though. Bruce has been a firewatcher there for seven years. He had been an actual firefighter before that, but he said that they encourage firefighters to move on (career wise) after a while because it is just too hard on the lungs to do it long term. So, he was lucky enough to become a firewatcher. Made it into the Grand Canyon park. It cost $12 per person to get into the park. I think Bob was expecting more like the flat fee for the carload, but the rangers manning the entrance station had other ideas. 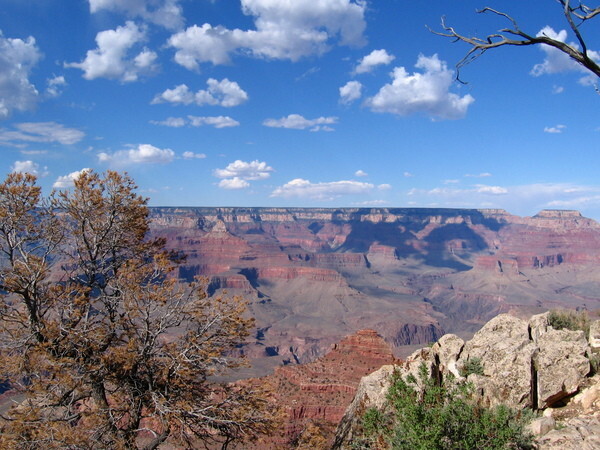 We went to Mather Point and Oooh'd and Aaah'd. I didn't take too many pics then, though. Too hazy, and the sun was too direct. Bob pointed out several temples and Phantom Ranch while we were viewing. We went to Mather campground next. We were in the Group campsite Sage sight #1. We got our bearings, saw some animals, and had supper. I ate the leftover 1/2 sandwich from lunch. The 7 of us (not Bob) then headed out for sunset. We went to Yavapi Point. We had a pretty good sunset. I had set up the tripod at a pretty good spot (not right down at the very end where 50 people were trying to squeeze, but up a little bit, where the crowds weren't as heavy, but the view was still good. While waiting for the right light, I took several pictures of people as well. After the sun had set, we went back to camp and went to bed. As with every night, the basic idea was the same: tarp on the ground. Sleeping pad on the tarp, and sleeping bag on the pad. As with earlier nights, I woke up several times, but managed to make it through the night.